At The News Wheel, we would like to say congrats to Buick, which recently celebrated its 110th birthday. After experimenting with cars built at his Detroit, Michigan home, David Dunbar Buick started the Buick Motor Company on May 19th, 1903. Buick has become one of the best selling brands in China, an emerging global market, selling nearly 67,000 vehicles in April alone. Last year Buick sold 895,000 vehicles worldwide. In addition to a thorough history spanning over a century, Buick also has an extensive motorsports history, performing on race-tracks since 1908. Between 1908 and 1910, then-president William Durant’s racing team won 500 trophies. Buick’s team also contributed to the war effort during both world wars, building the “Hellcat”, an M18 tank destroyer, in addition to aircraft engines and ammunition in World War II, and Liberty aircraft engines and experimental trucks during World War I. The Buick Model B, the first production vehicle, was offered to customers in 1904. Today, Buick produces a wide range of luxury vehicles including the LaCrosse, Verano, and Regal. “Consistency, longevity, reliability. Those are the words that come to mind when you talk about Buick,” said Leslie Kendall, curator of the Petersen Automotive Museum, in an interview. Celebrate with us as Buick turns 110 in 2013. 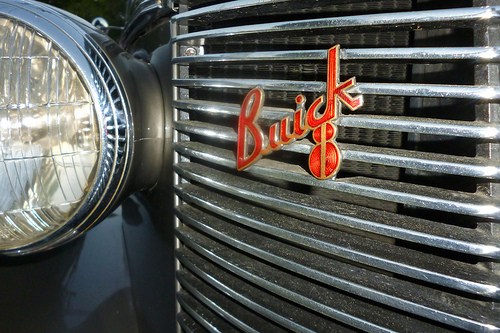 We will be posting more on Buick’s history and their milestones, so stay tuned to thenewswheel.com. McCoy Motors is located in Flagstaff, AZ and was founded in 1968 by Lewis McCoy. The dealership carries a full line of GMC and Buick vehicles. Their friendly and experienced staff is ready to help find the perfect car, truck, or SUV for every customer. The goal at McCoy Motors is to make the car buying experience easy and enjoyable sot that customers are smiling on the way in and as they drive out.